I was goofing around with my home lab and ran into an interesting tidbit regarding iSCSI port binding in 6.5. 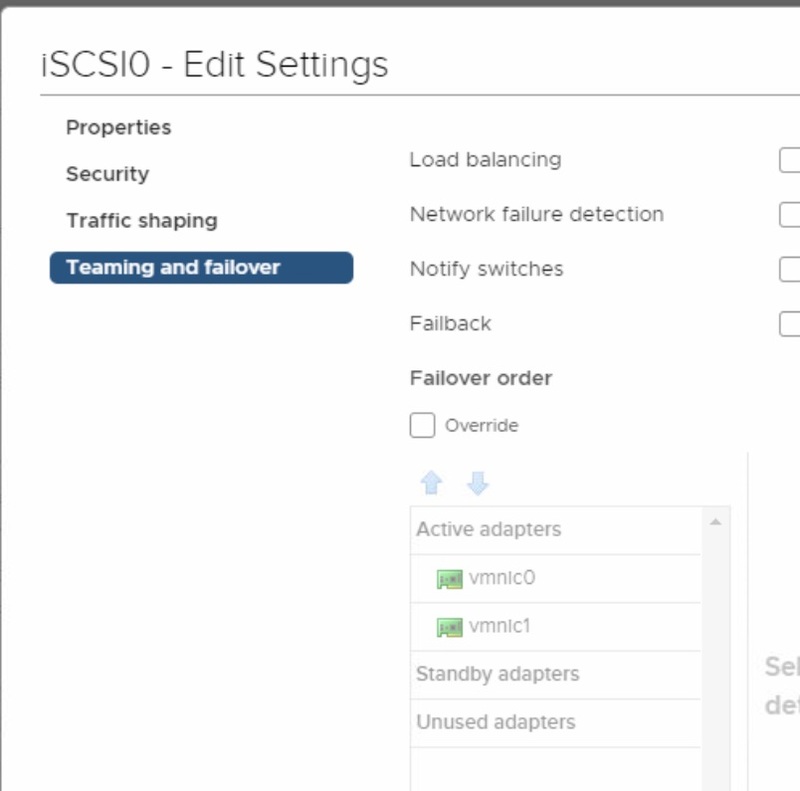 Under Networking, click Virtual switches, and select the vSphere switch that you want to modify from the list. On the Edit Settings wizard, click Teaming and Failover and select Override under Failover Order. but when I try that, there is no Teaming and Failover option. This really had me pulling my hair out, until (for kicks) I tried the new HTML5 client. Found it! So now there are features removed from the Flash client and only available in the HTML5 client? Better keep them both open! This entry was posted in Network, Storage, Virtualization, VMware and tagged iSCSI. Bookmark the permalink. That first screenshot looks like you are editing a VMkernel adapter, while the second (HTML5) looks like you are editing a port group. You should be able to do this in the flash client, you just need to edit the port group on the vSwitch. Right, so a vmkernel port added to a standard switch creates a unique port group that can only be used by that vmkernel port. 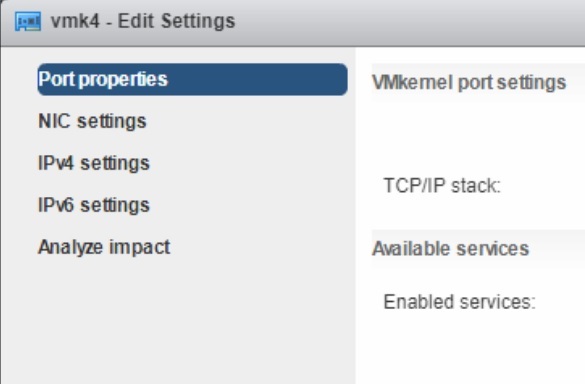 But, in 6.5 flash client (I haven’t tried earlier versions) you can’t select the portgroup for the vmkernel, and the vmkernel doesn’t have the port group settings. In the fat client you can modify the port group settings after you select the vmkernel port (and you can’t tell there is a unique port group). The interface is clunky but to get to the nic teaming setting you click on the vSwitch and then click on the top line of the box you’re in. A pencil and an X will appear. Click on the pencil to edit it. My problem with this interface is that you can’t tell what you’re actually selecting so it is hard to just figure stuff out without just stumbling around in the dark. Yeah, the issue is the documentation tells you to click on the vmkernel adapter and not the port group of the vmkernel adapter. Is there a way to configure port binding via command line? I’d like to script this to make the build of ESXi hosts automated. I don’t see the switch/NIC config in that post so you’ll need to get the commands to setup the switching also.